As an illustration, let consider that I want to update the installed tcolorbox package to the new one from the CTAN. I have downloaded the newest tcolorbox.zip package from ctan.org/pkg/tcolorbox. I extracted it and its contents are shown as follows. 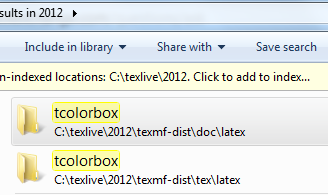 I noticed there are two folders related to the installed (old) tcolorbox as shown in the following figure. 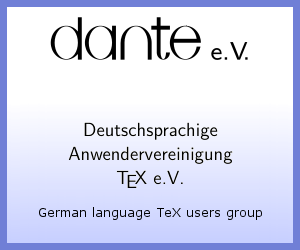 How do I know which files in the extracted folder should be copied to ...\doc\latex and ...\tex\latex? Is there a more convenient way to do it? Do I need to invoke texhash at the end? Should the package authors separate the main files from the document files with two subfolders in their zipped packages to ease manual update? In the distribution documentation is separated from run time files, but it isn't essential that you do that, so if in doubt (or in a hurry) just leave all the files together in a directory in your input path. which is an unmodified texlive 2012 setup. Path segments prefixed by !! require texhash path segments ending in // include all subdirectories to any depth. Not the answer you're looking for? Browse other questions tagged packages texlive updating or ask your own question.